In late 2006, Clear Channel Music posted the entire The Rising Tied album complete with commentaries from Mike Shinoda before each song. On "Red To Black", he said, "On the Linkin Park album Meteora we did a song called ‘From The Inside’, which is a 6/8 time song. That means there’s 6 counts per measure, uhm, and that’s more... usually more of a rock thing, or more… it’s less of a hip-hop thing, you don’t really hear hip-hop artist doing a 6/8 time song. 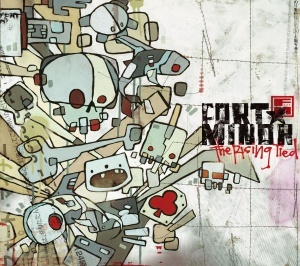 But I really liked doing it and I wanted to do it some more on the Fort Minor album. ‘Red to Black’ kinda came up in that way and since it was that 6/8 time, and it had me and Styles of Beyond already on it, I wanted to try and get a couple more artists to just take that weird, you know, hip-hop, but non-hip-hop thing to the next level. And so I gave a couple of friends of mine a call and that was Kenna and Jonah Matranga and I just thought that the three of our voices together was the weirdest thing, but it worked for this song." While a lot of the songs on the album came pretty easily, Mike says "Red To Black" was hard to do. Features vocals by Kenna, Jonah Matranga and Styles Of Beyond. "Red To Black" debuted at Fort Minor's performance at MySpace's 2nd Anniversary Party. It was featured near the end of the main set during its live history, and featured a post-song drum solo after most of its performances. At the last show of the 2006 U.S. Tour in San Francisco, California, Jonah Matranga, who is featured on the studio version of the song, came out and performed the song with Fort Minor. The song was performed throughout 2006 (though unconfirmed for the Summer Sonic appearances). It did not return when Mike brought Fort Minor back in 2015.